Are you in the Dallas or Grand Prairie, TX area thinking about getting micro braids, but aren’t sure of where to go? The good news is you don’t have to look any further! Beauty Concepts Salon is the only name you need to know when it comes to African hair braiding. Call us at 817-724-9059 or you can schedule a consultation online. Micro braid styles are completed using a technique in which only the hair base is braided. The style is defined by its name, and is achieved using small, thin, very delicate braids. With a proper hair care routine, micro braids can last for a few months, and work well for clients with natural or relaxed hair. This style is not recommended for clients with very fine hair. 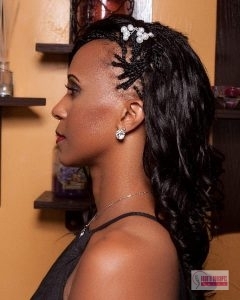 Our expert hair braiding techs can get this style done for you in three to four hours. But keep in mind, it does depends on the client, so the times can vary. Don’t wait another minute. If quality micro braid installation in Dallas and Grand Prairie, TX is what you’re looking for, then you’ve found it right here! Contact Beauty Concepts Salon right now at 817-724-9059. Updated on August 4, 2016 at 2:41 pm by Beauty Concepts Salon.